In order to sidestep the prohibition against actually depicting Mohammed, artists in Muslim societies sometimes showed him with his face blank or hidden. This way it could be claimed that they never actually drew Mohammed -- only his clothes. The Prophet Mohammed in a Mosque. Turkey, 16th century, painting on paper. Museum of Fine Arts, Boston. The artist depicted Mohammed in very long sleeves so as to avoid showing his hands, though his neck and hints of his features are visible. 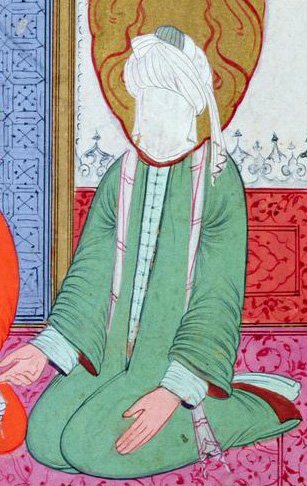 This is a miniature from Siyer-i Nebi, a Turkish religious biography of Mohammed completed in 1388 and later lavishly illustrated with 814 miniatures under the reign of Ottoman ruler Murad III, being completed in 1595. 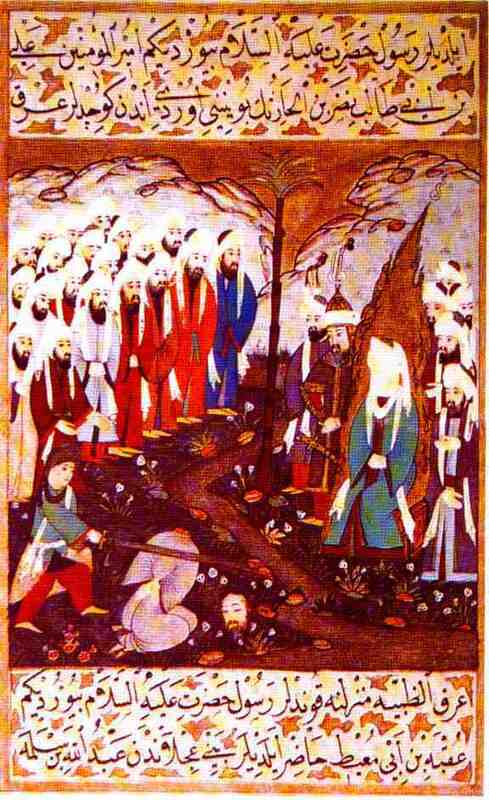 Many of the miniatures depict Mohammed, and this particular one shows Ali bin Abu Taleb beheading Nasr bin al-Hareth in the presence of Mohammed and his companions. Mohammed Splits the Moon. 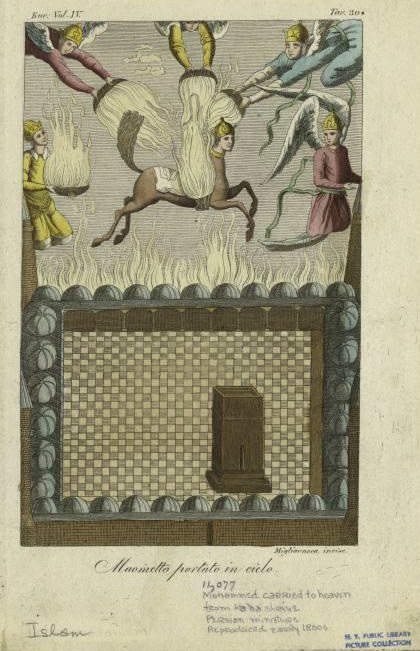 Illustration taken from a "Falnameh," a sixteenth century Persian book of prophesies. 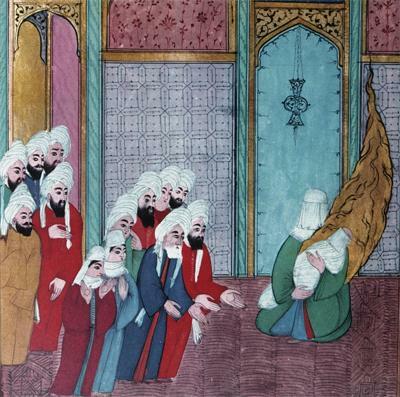 Artist unknown; watercolor painting; Mohammed is the veiled figure on the right. Currently housed in The Saxon State Library, Dresden, Germany, part of an exhibition that was displayed at The Library of Congress in 1996. The original image can be seen here. Newly born Mohammed in his mother's arms being shown to his grandfather and Meccans. 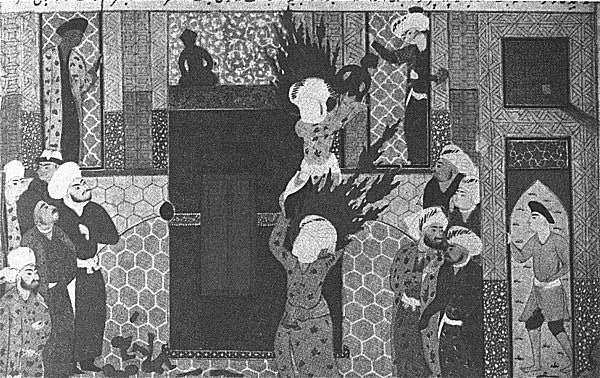 From a Turkish book illustration (date unknown). University of California, San Diego. 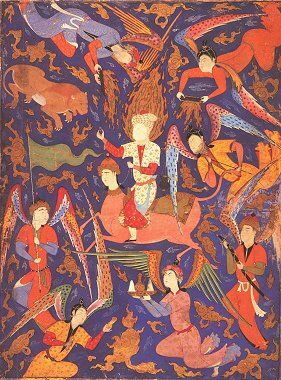 Persian miniature from the mid-1500s depicting Mohammed ascending to Paradise astride the miraculous horse Buraq, surrounded by angels. In Islamic lore, this event is called the "Miraj," or the Night Journey. 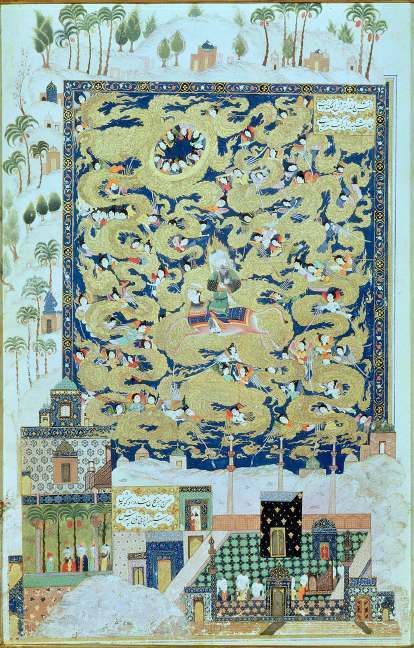 From a miniature made to illustrate a copy of the poems of Nizami, called Nizami's Khamsa (Five Poems). Tabriz, Persia, 1539-43. Currently housed in the British Library, London. 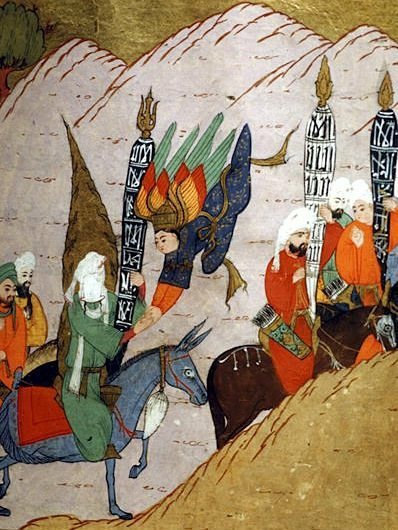 A close-up from the same picture as above, only showing the Mohammed figure. 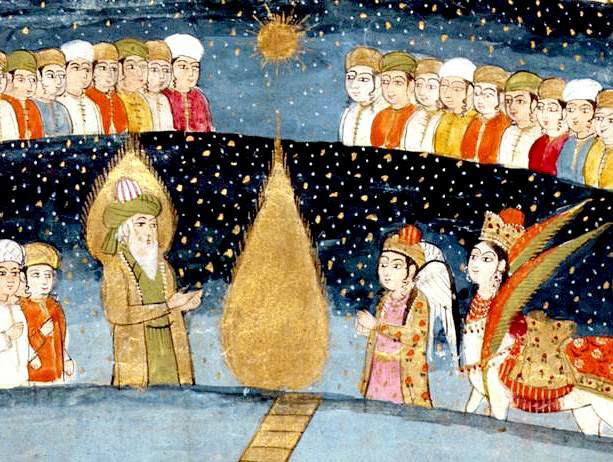 16th-century version of a 14th-century original painting showing Fatima (foreground), on her way to a Jewish wedding party, receiving a parcel of the green cloak brought by the Angel Gabriel from Paradise, in the presence of Mohammed (on the right), his young wife Aisha (next to him), and family members. Currently in the Chester Beatty Library, Dublin. Detail of Mohammed from the picture above. 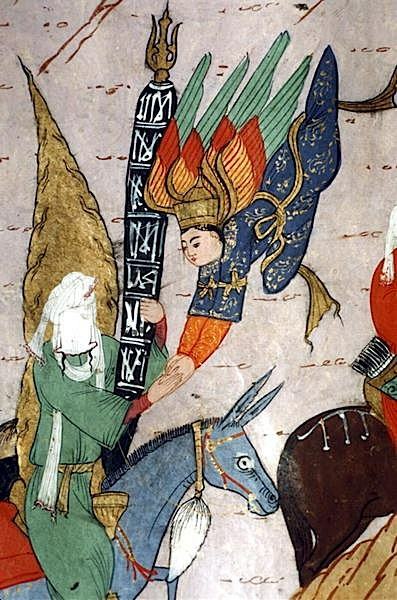 Mohammed carried to heaven ("Maometto portato in cielo") from the Kaaba. Persian miniature, reproduced early 1800s. A page from the book Il costume antico e moderno, o, storia del governo, della milizia, della religione, delle arti, scienze ed usanze di tutti i popoli antichi e moderni by Giuli Ferrario (published sometime between 1823 and 1838). In the collection of the New York Public Library. 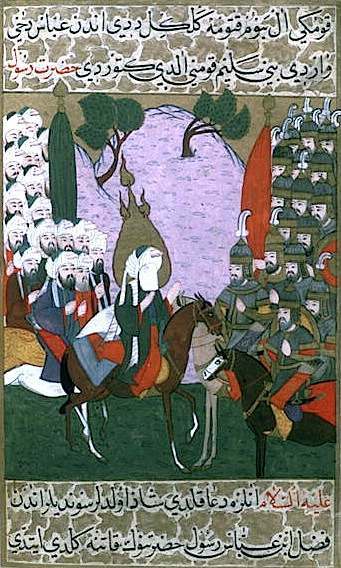 The Prophet Muhammad and the Muslim army at the battle of Uhud: illustrated leaf from a manuscript of the Siyar-i-Nabi, made for Sultan Murad III, copied by the scribe Mustafa bin Vali, Ottoman, Constantinople, c.1594. Sold by auction at Sotheby's in 2001. 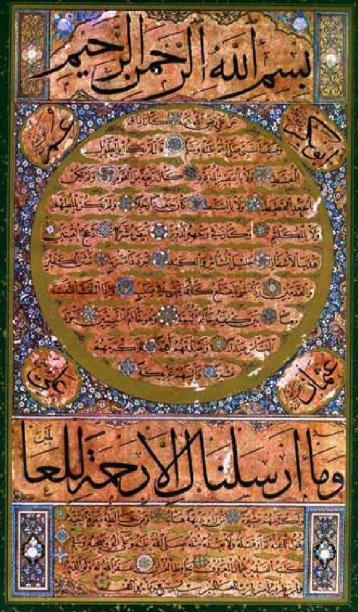 Photograph of a book page from a "chronicle of Islamic history from the 18th century," found in this press release about the Princeton Digital Library of Islamic Manuscripts. Exactly which manuscript is unknown. 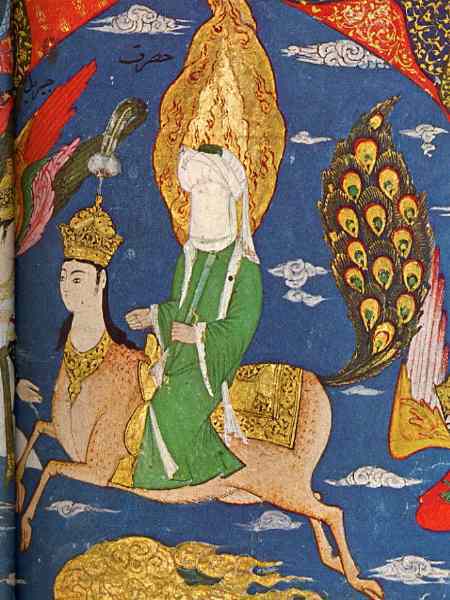 The image shows a veiled Mohammed riding on a pink Buraq with an especially flashy peacock tail. 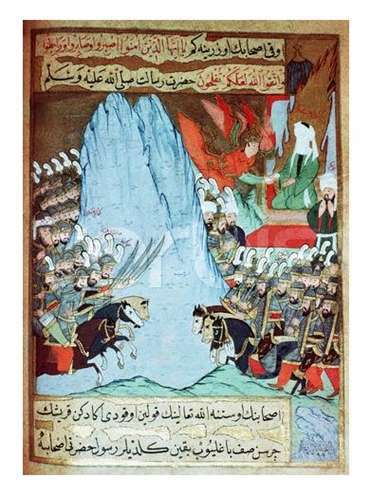 Islamic image of the Koran being revealed to Mohammed during a battle. Source unknown. The Angel Gabriel cleansing Mohammed's heart of impurities in preparation for his ascent to heaven, while the other angels watch. 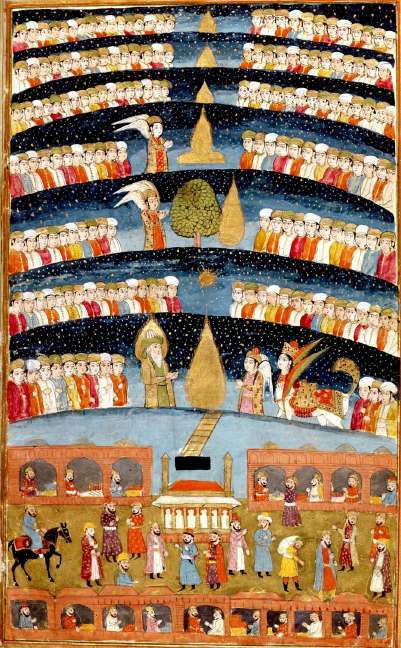 From the 16th-century manuscript The Progress of the Prophet, from Turkey. 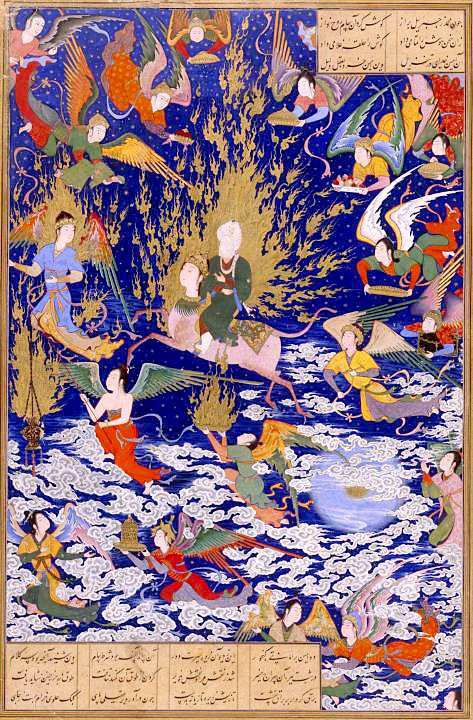 Image taken from this site which not only features other images of Mohammed but also has a very informative essay about the folkloric and mythological origins of the "miraj," which is not actually described in the Koran. 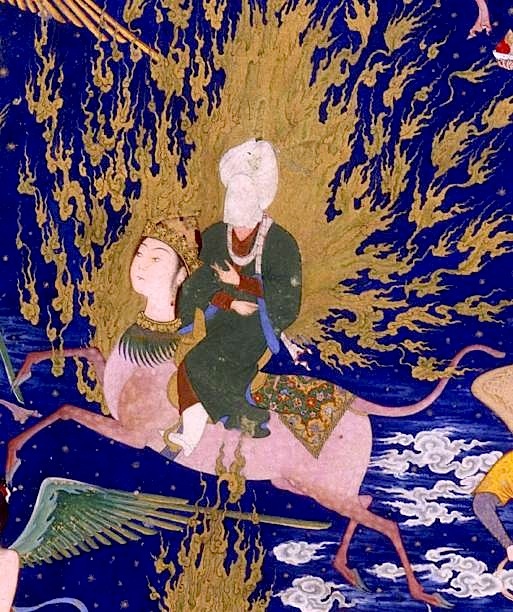 Another image of Mohammed riding Buraq up to heaven. Provenance unknown; taken from the same site as above. A wider-angle (but lower-resolution) version of this same image appeared in Chapter 11 of Carl Sagan's 1980 science documentary "Cosmos" at exactly 44:52 into the episode (as seen in this screenshot from the show), but the screen credits also do not cite where the image was found. 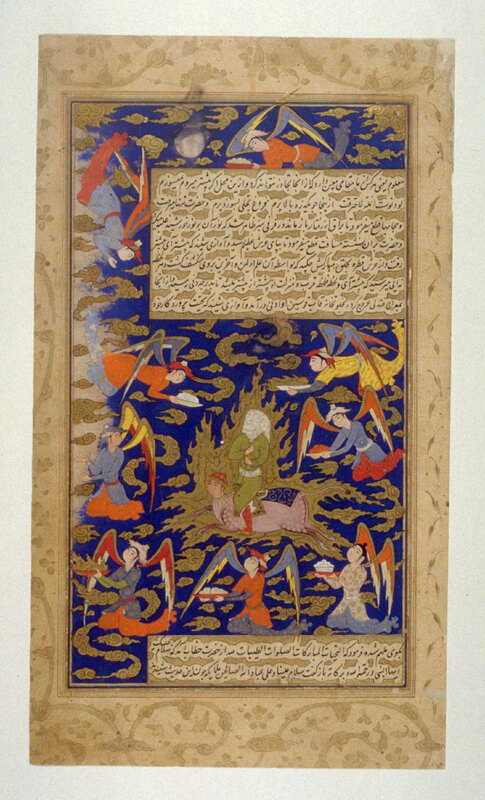 Allegorical scene of Mohammed riding Buraq during his "Night Voyage." Origin unknown. Mohammed at the Kaaba. 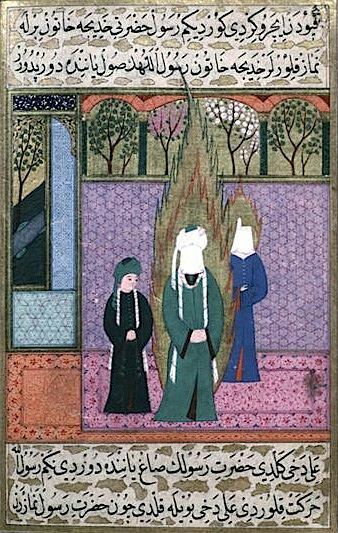 Miniature from the Ottoman Empire, c. 1595. In The Topkapi Museum, Istanbul. Mohammed with the Angel Gabriel. 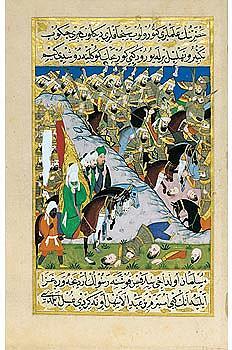 Miniature from the Ottoman Empire, c. 1595. In The Topkapi Museum, Istanbul. Mohammed praying at the Kaaba in Mecca. 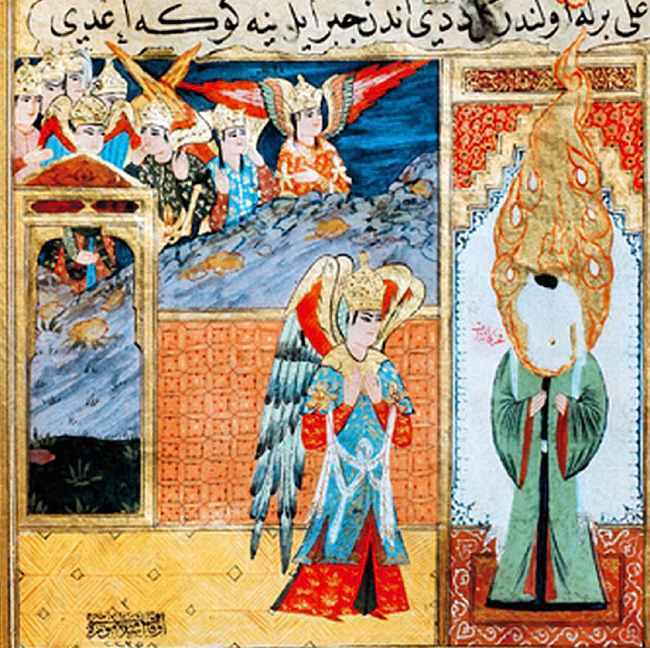 From the Siyer-i Nebi, a Turkish epic about Mohammed written by Mustafa, son of Yusef of Erzurum; original manuscript completed in 1388 A.D.; illustrated during reign of Murad III and completed in 1595 A.D. Currently housed in the Topkapi Palace Museum, Istanbul. 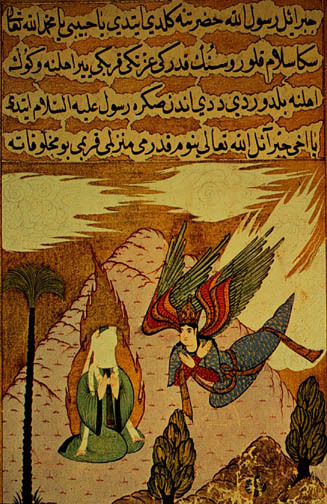 Mohammed, on a blue donkey, touching hands with the Archangel Gabriel, from the 1595 illustrated edition of the Siyer-i Nebi. Topkapi Palace Museum, Istanbul, Turkey. Detail from the picture above. 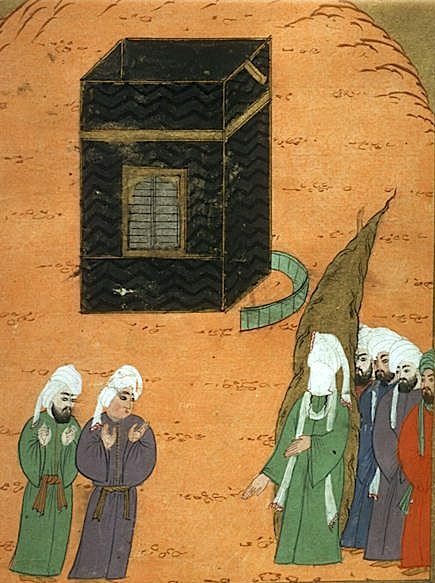 Mohammed standing before the Kaaba in Mecca, from the 1595 illustrated edition of the Siyer-i Nebi. Topkapi Palace Museum, Istanbul, Turkey. 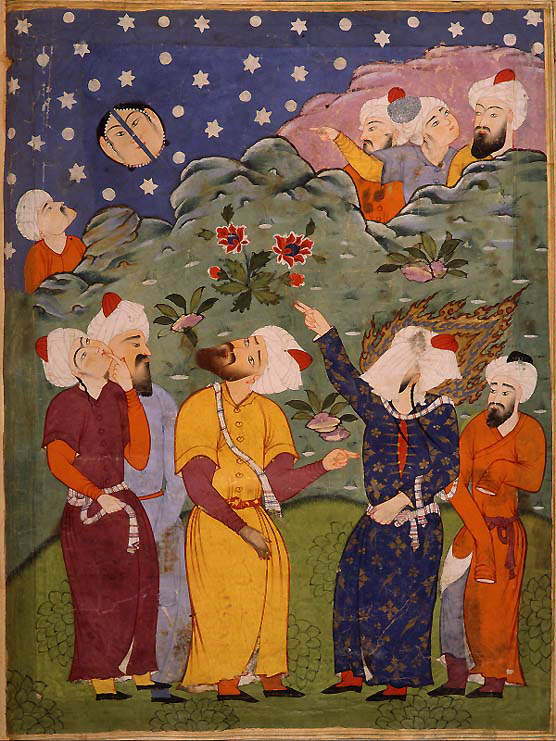 Mohammed receiving a vision near Mecca, from the 1595 illustrated edition of the Siyer-i Nebi. Topkapi Palace Museum, Istanbul, Turkey. 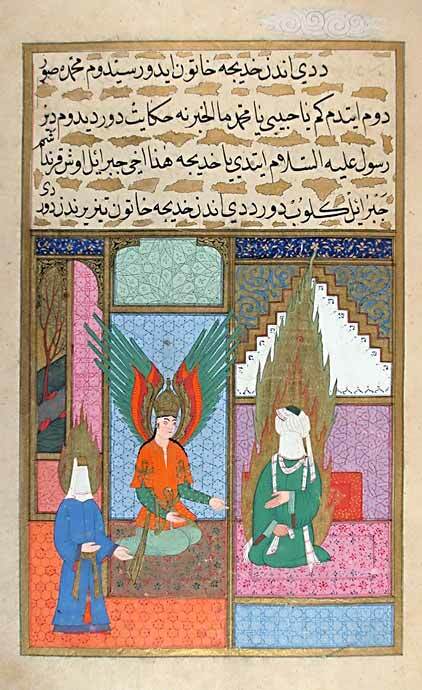 The Archangel Gabriel giving the Annunciation to Mohammed, from the 1595 illustrated edition of the Siyer-i Nebi. Topkapi Palace Museum, Istanbul, Turkey. 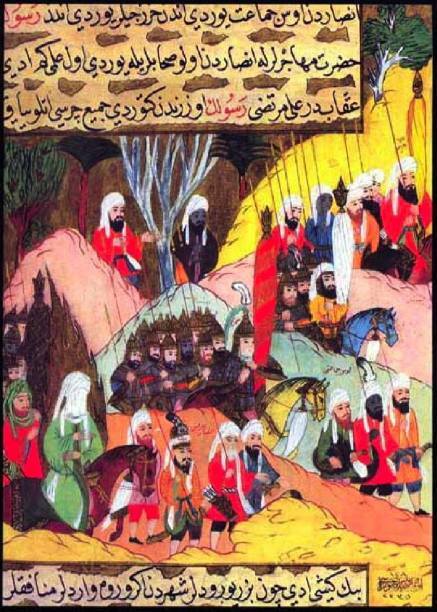 Mohammed and his followers having a rendezvious with soldiers, from the 1595 illustrated edition of the Siyer-i Nebi. Topkapi Palace Museum, Istanbul, Turkey. 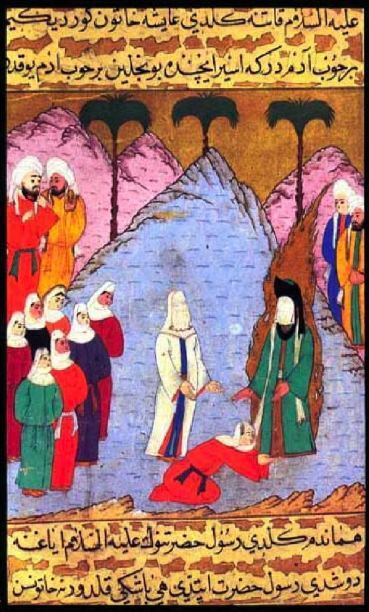 Mohammed on his deathbed; his face is covered, and another man's face is over his. 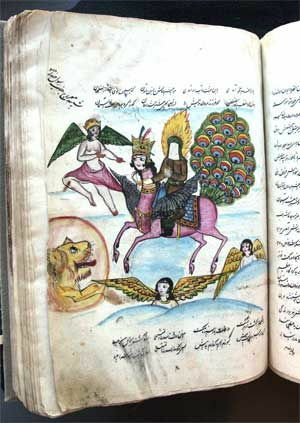 From the 1595 illustrated edition of the Siyer-i Nebi. Topkapi Palace Museum, Istanbul, Turkey. 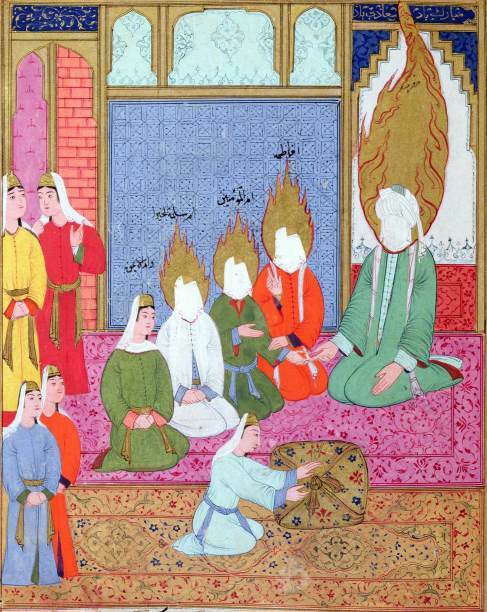 Mohammed with his daughter Fatima and son-in-law, Ali, from the 1595 illustrated edition of the Siyer-i Nebi. Topkapi Palace Museum, Istanbul, Turkey. 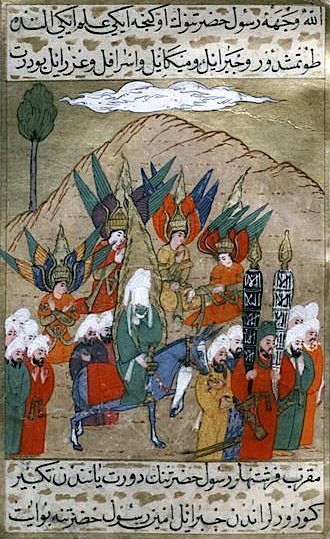 Mohammed and his followers travel to Mecca, from the 1595 illustrated edition of the Siyer-i Nebi. Topkapi Palace Museum, Istanbul, Turkey. 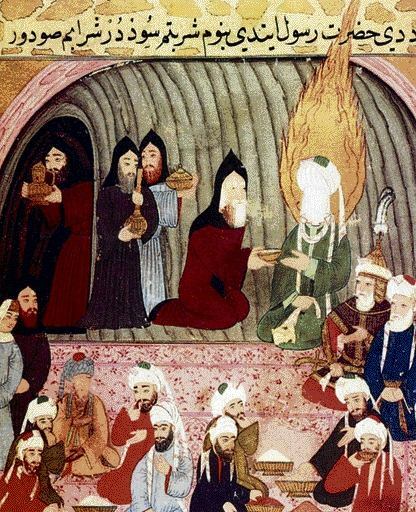 The unattributed image of Mohammed sitting on a rug at a banquet was posted on the blog of a Dutch-Iranian academic. 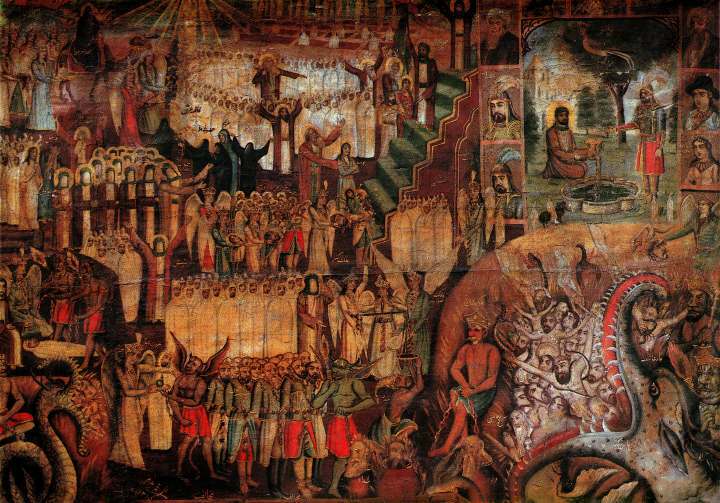 Mohammed is depicted in the center of this painting, with his face covered. The painting is called "The Day of the Last Judgment"; signed by the artist Mohammad Modabber, from 1897. In the Sa'd-Abad Cultural Collection (Iran). Published in the book Coffee-House Painting, by Hadi Seyf (published by the Reza Abbasi Museum). 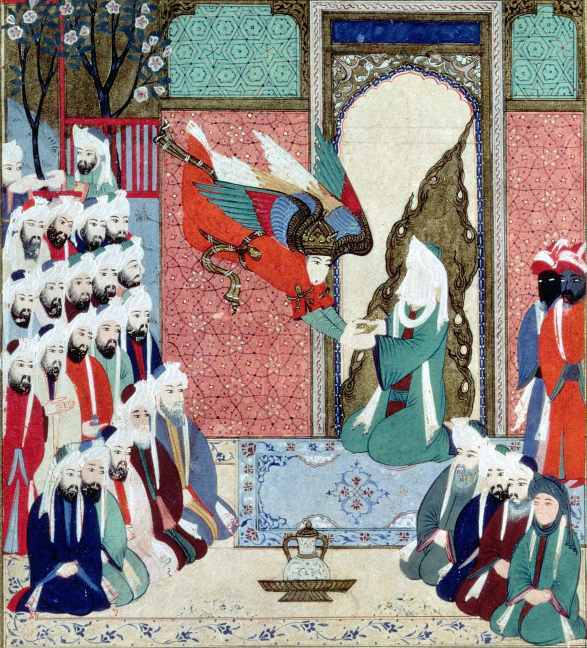 A similar painting with the same name, but showing Mohammed's full face, can be found on the "Islamic Depictions of Mohammed in Full" page. 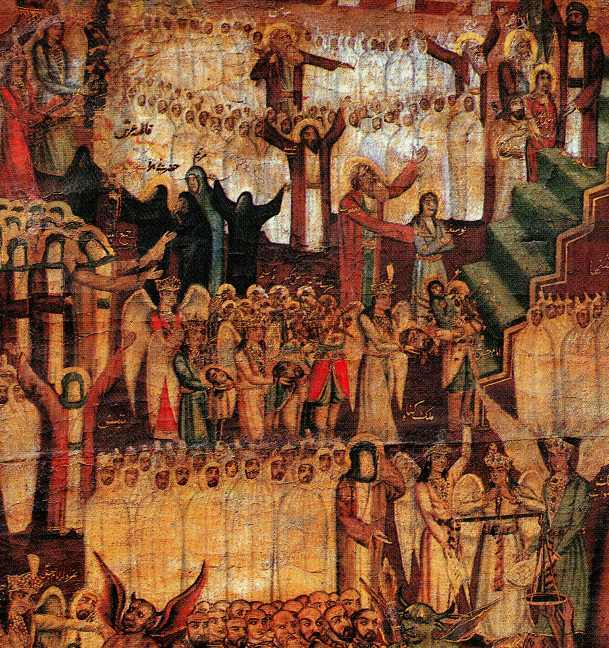 Detail of the painting above, showing Mohammed in the lower center with his face covered, observing angels using the scales of justice. Other holy men, also with their faces covered, can be seen on the left. 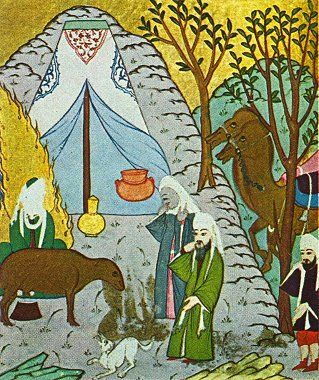 This unusual scene of Mohammed comes from this site, which gives as its caption, "Muhammad and Abu Bakr visit poor Bedouins who have no sustenance to share until the Prophet makes their ewe give milk." No date or place of origin is given. Mohammed is apparently the veiled figure at the extreme left milking the ewe. 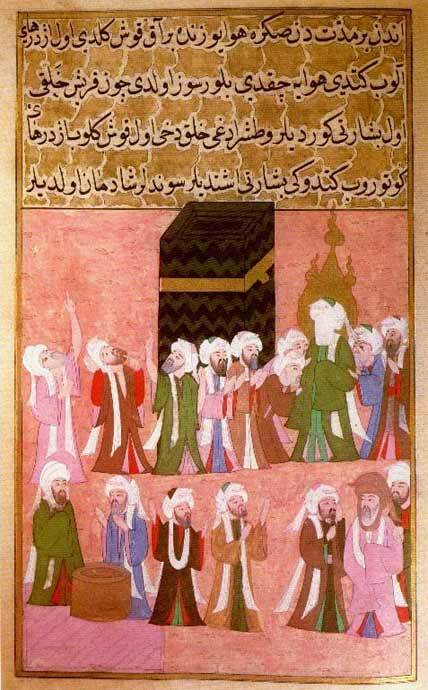 Mohammed at the Kaaba, supervising the removal of pagan idols, including Hubal, the chief diety of Mecca prior to Mohammed's introduction of Islam. Mohammed and his wife Aisha freeing the daughter of a tribal chief. From the Siyer-i Nebi. In the Topkapi Palace Library, Istanbul. 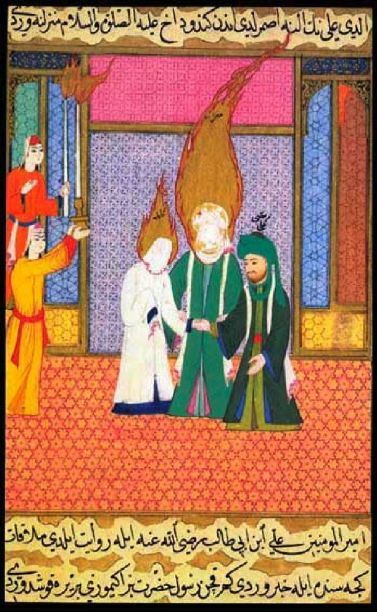 Mohammed giving his daughter Fatima in marriage to his cousin Ali. From the Siyer-i Nebi. In the Topkapi Palace Library, Istanbul. 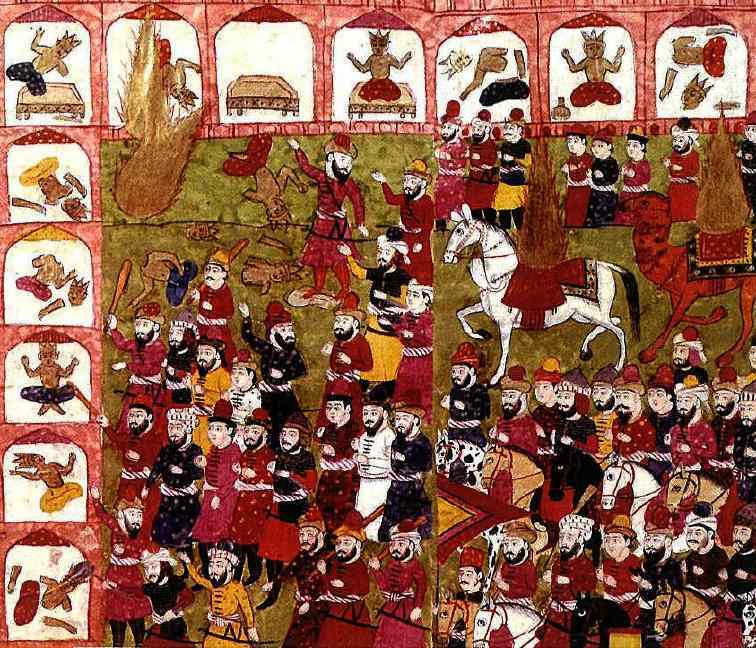 Mohammed (in green, lower left) marching to the Battle of Uhud. From the Siyer-i Nebi. In the Museum of Turkish and Islamic Art, Istanbul. 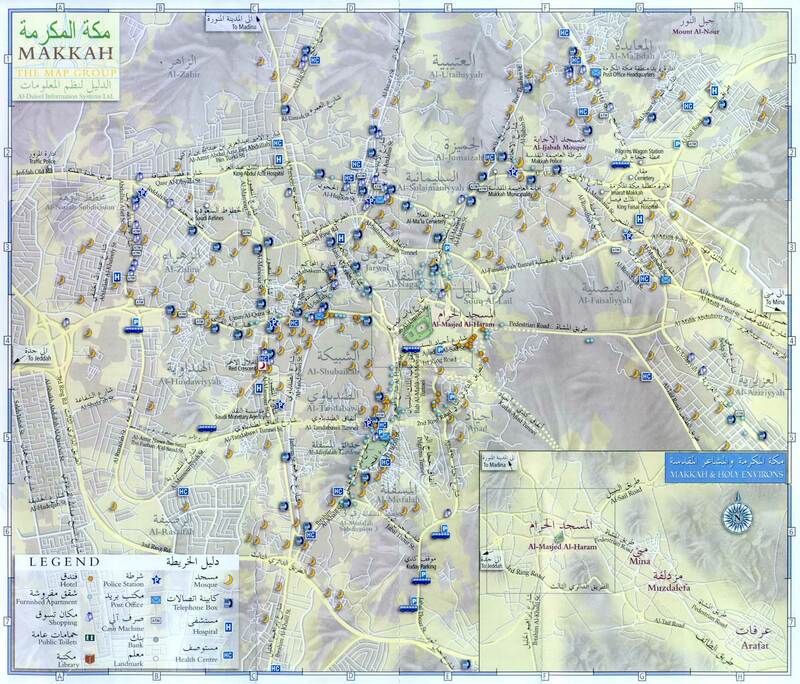 The Angel Gabriel appearing to Mohammed, on Mount al-Noor (a hill near Mecca where Mohammed received his first visions; you can find it on this map of Mecca as "al-Nour," upper right). 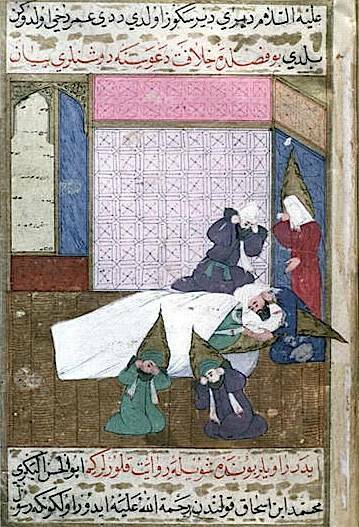 A miniature illustration from the biography of Mohammed entitled Siyar-i Nabi, by Ahmed Nur Ibn Mustafa, published in Turkey, 18th century. 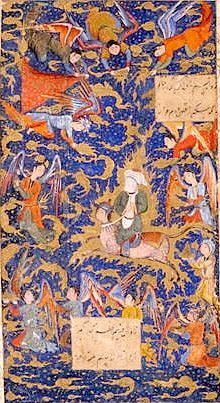 Mohammed on the "Miraj," or Night Journey, riding on Buraq amidst angels. From the Khamsa of Nizami, Shirazi style of painting, Persia, 1517 AD. This is one of the clearest examples of Mohammed being painted originally with his face visible, but having it later scratched out by a religious zealot. Published in the book Islamic Art. 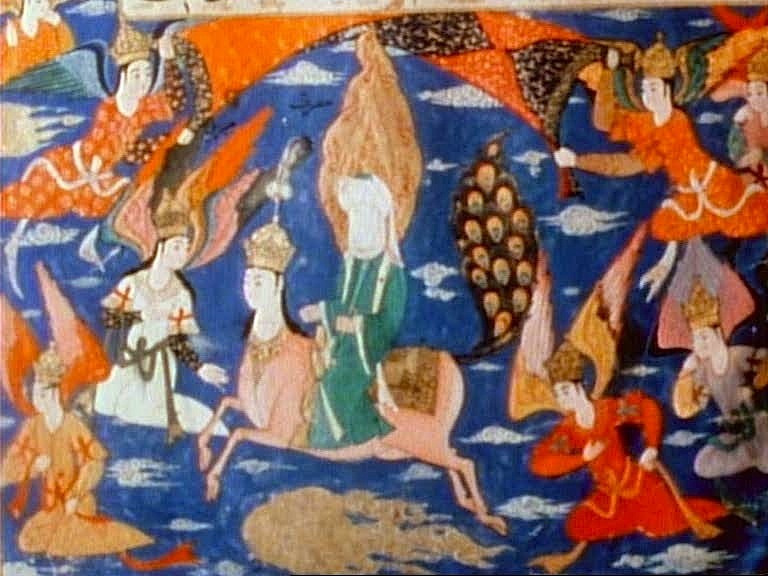 The Ascent of Mohammed to heaven on Buraq. From a Persian manuscript, c. 1570. Opaque watercolor and gold on paper. From the collection of the Fine Arts Museums of San Francisco. A full-size image of the full painting can be viewed here. A catalog listing gives the specifics of the work here. 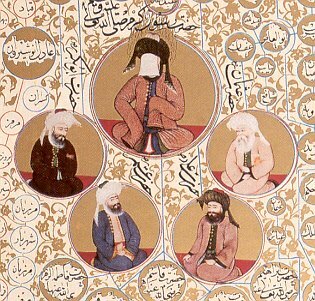 Mohammed (top, veiled) and the first four Caliphs. From the Subhat al-Akhbar. Original in the Austrian National Library (Österreichische Nationalbibliothek) in Vienna. 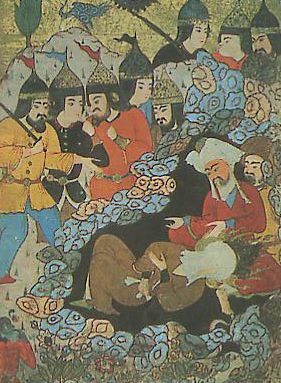 Mohammed (with face not visible) lying (possibly dead) in a grotto, with anachronistic Mongol warriors looking on. 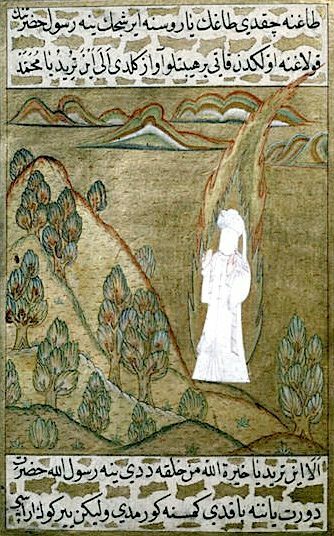 Indian or Asian painting of Mohammed receiving visions. Mohammed flying over Mecca during the miraj, his ascent to heaven. Turkey, early 17th century. From the Los Angeles County Museum of Art. 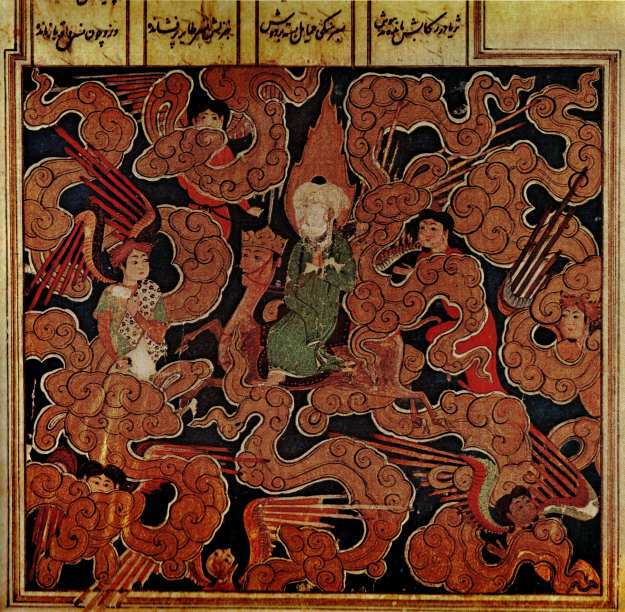 Mohammed (seated on a white horse, head shrouded in sacred fire) destroying the idols at the Ka'aba in Mecca. From an 11th-century Persian miniature, housed in the Bibliotheque Nationale, Paris. Mohammed ascending to Paradise. 16th century painting, currently housed in the Seattle Art Museum. 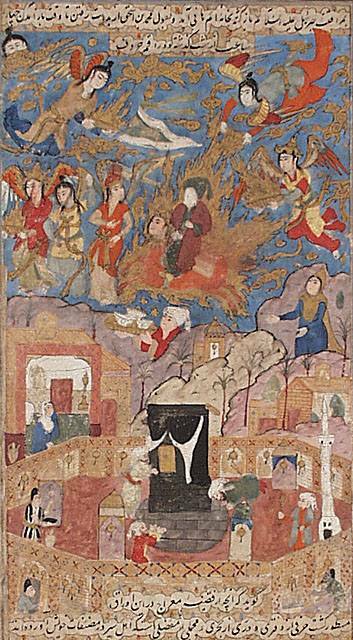 "Ascent of the Prophet to Heaven," from this site. which gives as the attribution, "Persian, 1550." 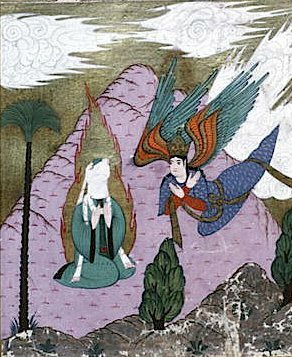 The Archangel Gabriel appearing to Mohammed. An illustration from a 1594-5 Turkish edition of the Siyer-i-Nabi. In the Louvre Museum, Paris. The Archangel Gabriel inspiring Mohammed in the Medina Mosque. 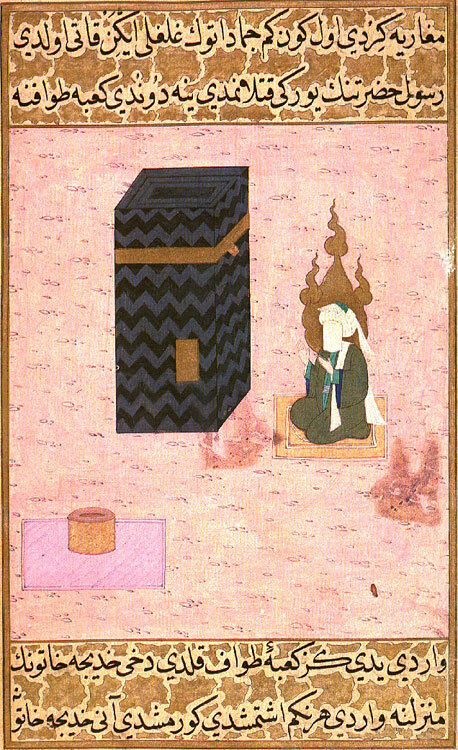 18th century Ottoman painting, purportedly a copy of an image in an 8th century Koran (though that seems unlikely). In the Museum of Turkish and Islamic Art, Istanbul. "Mohammed's Paradise," a rare supposedly 11th-century miniature from the volume The History of Mohammed, produced in Persia in 1030. (Though the style seems much later than 11th century.) It is not clear which figure is Mohammed -- see detail below. Now in the Bibliotheque Nationale, Paris. Detail from the picture above. 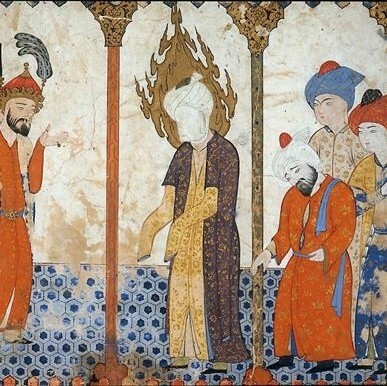 Mohammed is likely the figure entirely engulfed in gold flame; the man with the green turban is most probably the semi-mythological figure Khidr, or Abu Bakr. Mohammed may also be one of the other figures elsewhere in the picture. 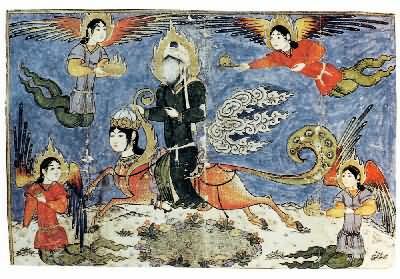 Mohammed riding Buraq up to Paradise. Persian, mid-16th century. Currently housed in the Worcester Art Museum, Massachusetts. Mohammed riding Buraq up to Paradise. 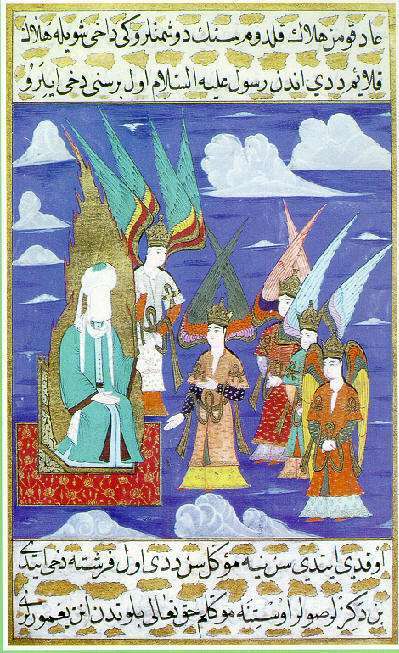 1504 A.D. illustration from the Khamsa of Elyas Nezami. Original in a private collection. 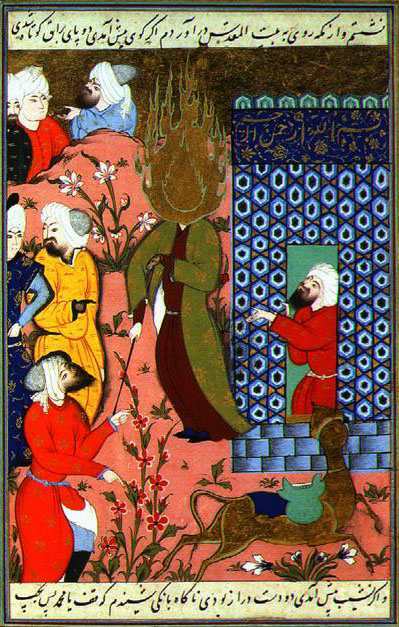 Mohammed (face not visible) in an illustration of an episode from the Koran. The Hilye-i Serif, by Hafiz Osman, 17th century. This is a calligraphic verbal description of Mohammed, as opposed to an actual representation of him. Such "word pictures" began to supplant visual depictions starting in the 1600s. In the Topkapi Palace Library, Istanbul. 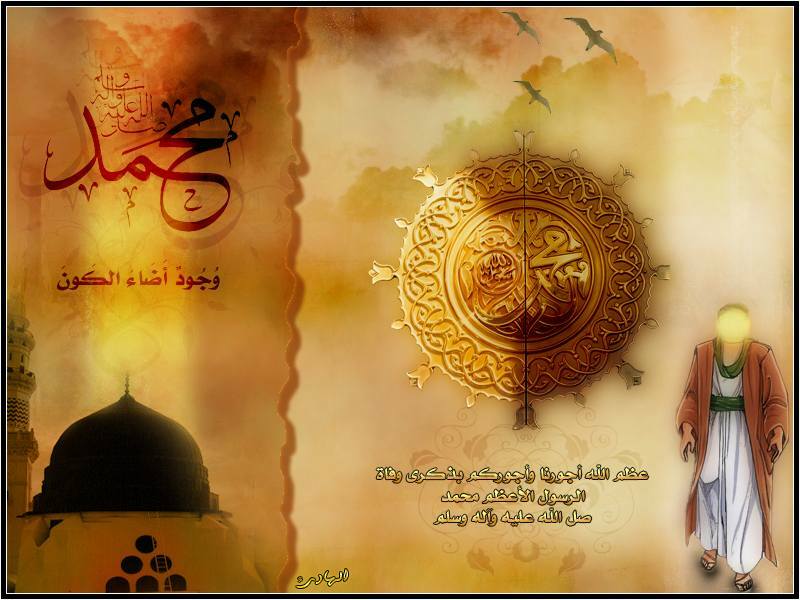 This graphic taken from an Islamic Web site features a depiction of Mohammed with his face obscured by a numinous glow. 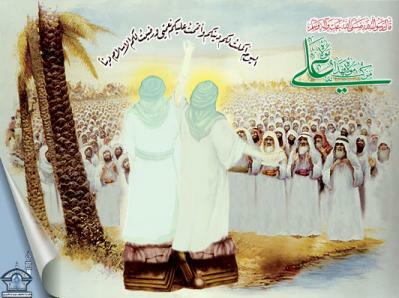 This contemporary Iranian image apparently shows Mohammed and Ali from the back. 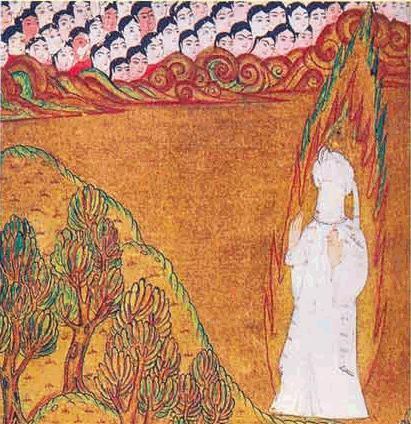 Ascent of the Prophet to Heaven. Persia, 1550. (Another) Ascent of the Prophet to Heaven. Persia, 1550. 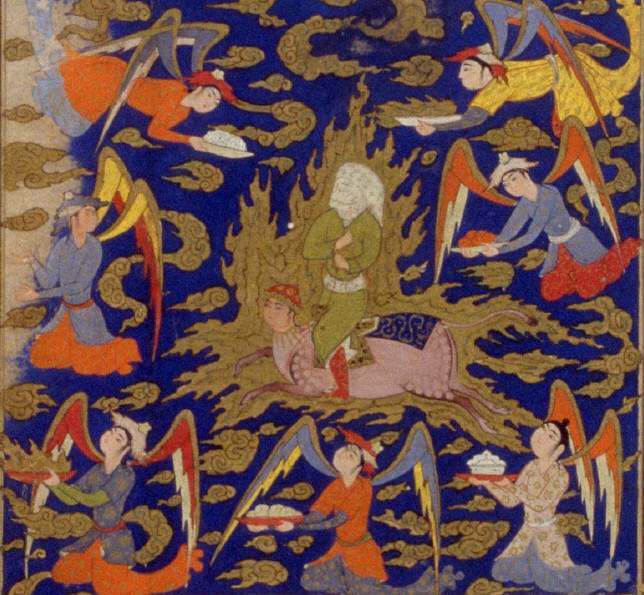 Muhammad on Buraq. Persia, mid-16th century. 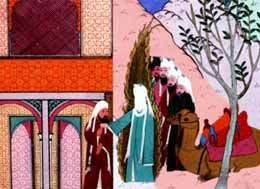 Muhammad and Abu Bakr visit poor Bedouins. 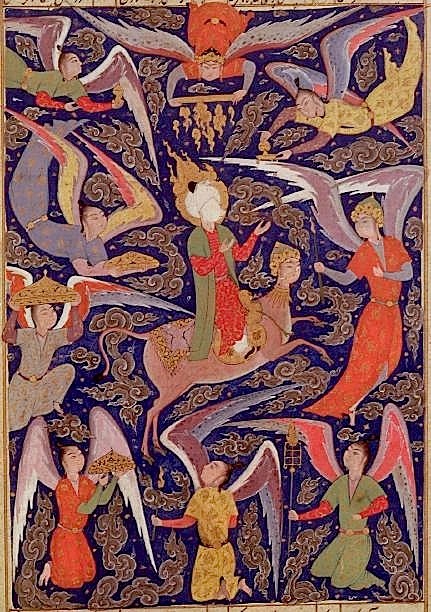 Another picture of Mohammed on Buraq from the Los Angeles County Museum of Art. Four small reproductions of the faceless Mohammed can be found on this academic site. A simplified, stylized rendering of Mohammed's standard "Ascent to Heaven" scene is posted on this Ukrainian site.